Home budapest thermal baths hungarian baths széchenyi thermal bath széchenyi thermal bath budapest széchenyi thermal bath budapest hungary thermal bath szechenyi budapest thermal baths in budapest Széchenyi Thermal Bath Budapest Hungary - Is it Worth Visiting? Széchenyi Thermal Bath Budapest Hungary - Is it Worth Visiting? Visiting one of the thermal baths in Budapest is an absolute must when you come to Hungary. 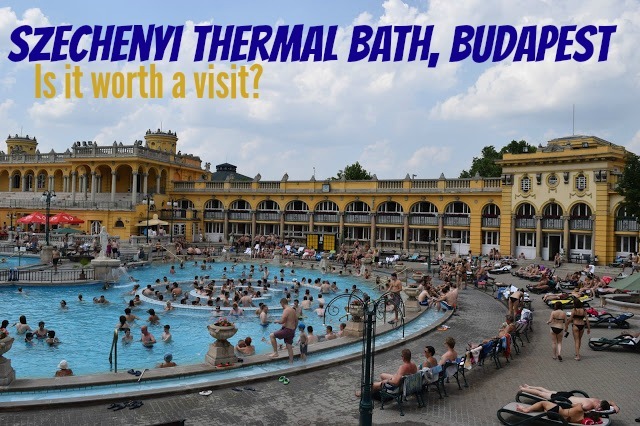 Hungary is the third most thermal country in the world (after Iceland and New Zealand) and Budapest is the only capital in the world that has rich thermal waters with healing properties. Hence why Budapest is known as the City of Baths. As Széchenyi Thermal Bath is the most famous and won a Certificate of Excellence on TripAdvisor, it's on a lot of people's Budapest bucket-lists. But does it deserve to be on there? Is it worth the hype? They say that first impressions are the most important, luckily that wasn't the case here as our first impression left something to be desired: The ticketing process was slow, despite there being four ticket booths, and exacerbated by the fact that we were put in the wrong queue. Visitors are given special bath wrist bands that you use to get through the gate, and to open/lock your lockers. We've seen this system before in Germany but there you can buy your band from a machine. This kind of system would probably speed things up here. However, this was only a minor setback, the room was so pretty and once we finally got through it was even more beautiful and we were excited to explore more. Avoid our mistake by skipping the queue at Széchenyi. Outside are three giant pools. Two are shallow and very warm - about 35 degrees Celsius. The third is a swimming pool and is presumably colder. I say presumably, we didn't actually go in as swim hats must be worn and we didn't have any with us. They were for sale at the entrance, but we weren't really there for swimming, we were there for relaxing. Also, if you don't have a GoPro, I recommend getting one, we used ours loads - and not just for water/snow sports, they're great for taking selfies too 😂 Get your GoPro here. The hot water of the two other pools was definitely relaxing, but as it was a hot, sunny day it quickly got too hot. We bet that it must be absolutely superb on a cold winter's day, with the added advantage that there are fewer tourists in winter. This would be great, as by midday it was packed! Update: I went in the winter, the outdoor pools are amazing!! It's so nice to sit in boiling water with your head all cold. It stopped me from feeling faint and was a great way to warm up in the winter. Highly recommended. Back to the summer, we escaped the heat and the crowds by heading inside, which is where we found the highlight of our day: the indoor pools. There were many pools inside, some shallow, some deep, some long and thin, others square. All beautiful, all different temperatures - some freezing, some boiling and everything in-between. It kind of reminded me of the Wood Between the Worlds in the Magician's Nephew book: 'a quiet forest dotted with many pools, each of which were portals to a different world.' Except there was no forest and the pools weren't portals... Unless you count the fact that they transport you onto a different plane of relaxation. Yey Széchenyi! The hottest pool was 40 degrees Celsius and the coldest 20. Relaxing in a hot pool before submerging into a cold one feels fantastic - like taking cocaine. Presumably. Our skin tingled and we felt incredible! The architecture was absolutely beautiful too, each room was slightly different with the most darling, ornate tiles and high ceilings. Inside Széchenyi thermal bath were a number of steam rooms and saunas. These were mixed and you have to keep your clothes on (of course). We enjoyed trying the different rooms and then plunging into the cool pools. And we really liked how each sauna was slightly different, our favourite was one had red glowing lights. Make sure you don't do what we did and miss the entire ground floor - there's a sauna there with an ice bucket for you to douse yourself in first/afterwards/both. We went for canteen food: veggie burgers and chips. It wasn't the best food we've ever had (or the cheapest) but you couldn't beat the location. I'd recommend you go for a pancake or a BBQ though. There are many drinking fountains dotted around the site. Make sure you try some of the water: it's some of the freshest we've ever tasted. In my opinion, Széchenyi thermal bath Budapest and indeed all the other thermal baths in Budapest that I've visited are much better in winter: it's far, far less crowded and that joy of sitting in hot steaming water with your head up in the cold can't be beaten. But if you've already decided to visit Budapest in the summer, don't despair - the thermal baths in Budapest are still awesome in the summer, and you can sunbath outside (which you can't do in winter). Looking for more things to do in Budapest? Check out this extensive 50 things you must do in Budapest guide! Private entry, optional massage + Danube River Dinner Cruise - this is probably the best way to make the most out of Budapest in one day - private entry to Széchenyi, optional massage and then enjoy a dinner cruise along the famous Danube. I highly recommend this tour. Bath entry + gourmet dinner - if rivers aren't your thing, go for a Széchenyi day followed by a gourmet dinner at a traditional Hungarian restaurant. Don't get Széchenyi thermal bath and Széchenyi Bridge confused, they're not very close to each other. 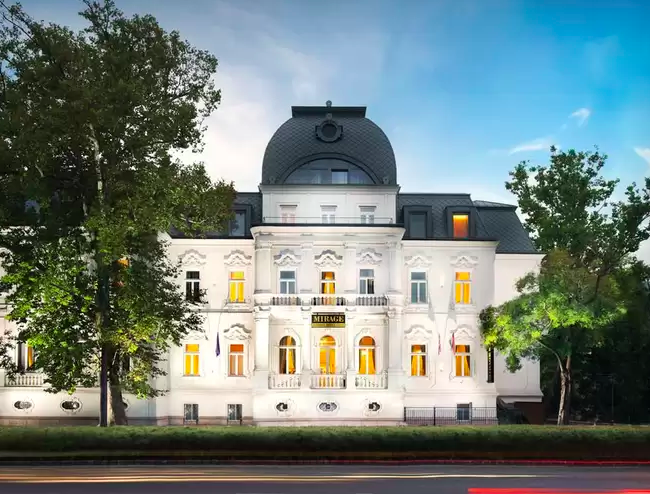 Mirage Medic Hotel (pictured) is the closest you can get to Széchenyi thermal bath - which is perfect, you can relax all day knowing that your hotel is nearby and you won't have to stress about getting there. Beautiful views of Hero's Square from the roof. Apartments Rippl Rónai - renting an apartment in Budapest, either through a hotel website or via Airbnb (click for $40 off), is popular and cheap. Rippl Rónai is beautiful and is also very close to Széchenyi. Baroque Hostel if you're travelling on a budget, opt for a hostel, but be careful - most accommodation in Budapest is budget (at least for westerns), so if it's really, really cheap, there's a reason for it. Baroque Hostel is one of the good ones, and again near Széchenyi. Conclusion: Széchenyi Thermal Bath Budapest Hungary - is it worth visiting? Is it worth visiting Széchenyi Thermal bath Budapest Hungary? ABSOLUTELY! Despite the annoying ticket-booth and rubbish food, I would definitely recommend that you visit thermal bath Szechenyi Budapest. It's a relaxing, beautiful way to spend the day! There's a reason that this place is so popular - relaxation, beauty, culture and history all go hand-in-hand here. Tickets include either a locker or a cabin, you could easily spend a whole day here, and I recommend a minimum time of 2 hours if you're in a rush - this will give you enough time to try everything out, without rushing too much. Buy the bikini here and the towel here. If you have the option, visit in winter - it's beautiful and quieter, but if you can only visit in summer, don't worry, it's still awesome! 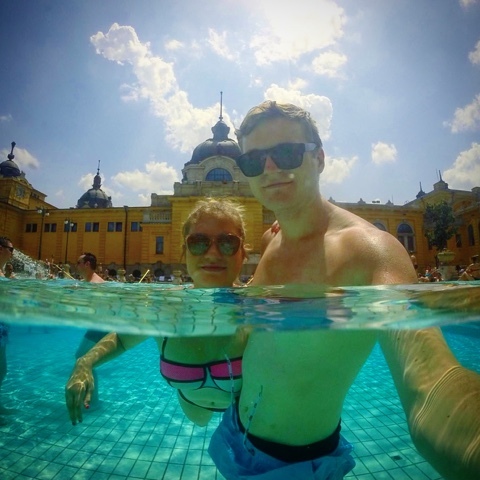 Have you been to Széchenyi Thermal Bath? Did you think it was worth visiting? Disclaimer: Travelling Weasels were invited at a 50% discount in return for an honest review. All opinions are our own.